Second highest peak in the Inland Kaikouras, featuring a spectacular steep drop from the summit to the south into Dart Stream (a tributary of the Clarence River). Via either the Clarence River or the Hodder River. Via Hodder River. Follow Staircase Stream routes, to the saddle between Alarm and Tapuae-o-Uenuku and onto the ridge. 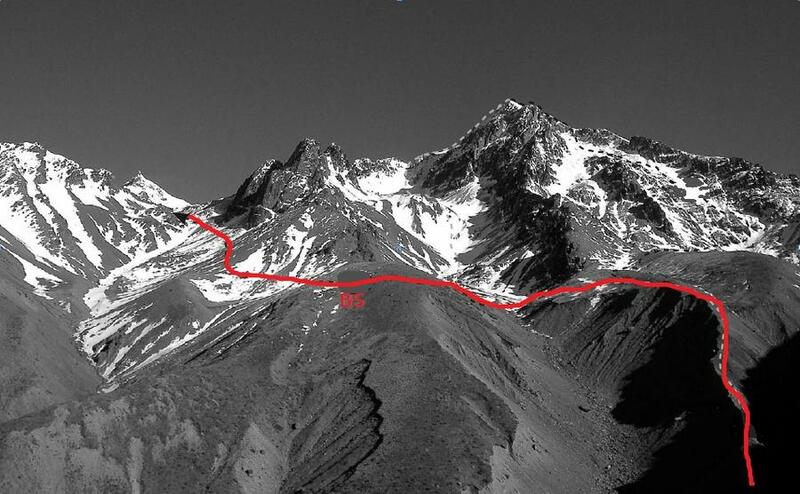 The last 100m before the summit is steep and may require a rope. Via Hodder River. An excellent winter or spring route. Ascend the highest Staircase Stream basin north of Alarm, angle southward up to a couloir in middle of face (with a steep step at the base which may be icy). Climb couloir directly up to the north-west ridge, slightly west of the summit, and scramble to the top. Two tools recommended. Via Hodder River. The ridge is gained by easy slopes, either directly from Staircase Stream or by traversing from Muzzle Saddle. It consists of a jagged ridge with six major towers of loose rock, some of which require a rope. Gain the ridge above the campsite in the central branch of Branch Stream, sidle into the southern branch, and then to the col between Dart Stream and Staircase Stream. From here, follow the normal North East Ridge route.